Reverend Raven: You know I hate these cookie cutter bios. I know they are necessary but you are only as good as last night's gig. I really haven't done anything special except open and meet B.B. King and have the honor of backing up Madison Slim for 10yrs, playing with great guys like R.J. Mischo, Cadillac Pete Rahn, Benny Rickun, PT Pedersen SC, Bobby Lee Sellers Jr, Big Al Groth, Bryan Lee, Billy Flynn, Pat Hayes and all the guys in my band present and past. Guys like Rick Holmes, Chico Johnson, Devil Roberts, Diesel, Evil Evans, Craig Panosh, Kern, Barefoot Jimmy, Frankie Panosh, Chuck Might, Mickey Larson, Benny Rickun many more. I get to go to festivals and see my heros, friends like Perry Weber, Jim Liban, Billy Flynn and get paid for it. That is cool. I've been blessed with great love, good friends and family and the ability to earn a living playing guitar and standing on chairs and tables. If I can put a smile on your face and get you to shake your rear end I've done a good job. Born and raised on south side of Chicago, the Reverend has been playing the blues since 1971 when he first saw Freddy King play at the Kinetic Theatre in Chicago. After 15 year hitch in the Navy he moved to Milwaukee where he began a long friendship and collaboration with Madison Slim, long time harmonica player for Jimmy Rogers. 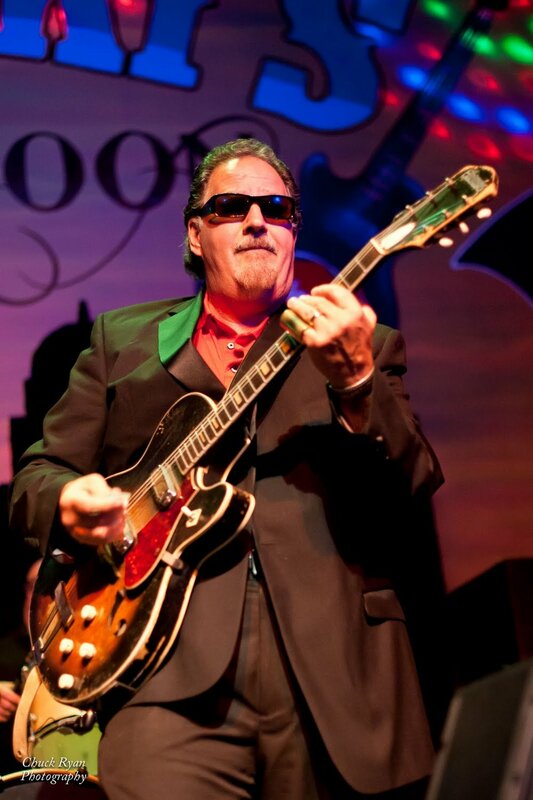 Since 1990 he has opened for B.B King, Gatemouth Brown, Pinetop Perkins, Koko Taylor Band, Junior Wells, Billy Branch, Magic Slim, Elvin Bishop, Sugar Blue, Lonnie Brooks, William Clarke, Lefty Dizz, Rod Piazza, Fabulous Thunderbirds, Duke Robillard, Jeff Healy, Trampled Underfoot, Mike Zito, Nick Moss, Tommy Castro and numerous others at festivals and at Buddy Guy’s Legends where he has been on rotation as a headliner for 16 years. Craig Panosh was our drummer in 1997 and 1998. In 1999 he left to tour with Bernard Allison and later with Bryan Lee. His brother Spencer was our drummer for 11 years. Now after 18 years he returns to the drum throne and brings a family history of percussion to the show. Craig is a third generation musician from the legendary Panosh family dynasty, who’s roots run deep though out the history of American music. A family with lineage dating back to the big band era (Grandfather Emery Sr.) of the 30’s-40’s & (Father Gino) Chess Records of the late 50’s-60’s respectfully. Craig is widely known for his work around the world with Bernard Allison, Bryan Lee, and The Ken Saydak Band. Over the years within the music industry, Craig has accepted numerous drumming/percussion awards, and has been featured in Modern Drummer magazine. Here are a few quotes from other articles. “Not only technically skilled but also withholds the deep pocket with power and dynamics”. He has recorded at the BBC in London, and performed on VOA (Voice Of American) live to US, Asia, Africa, and the Mideast. Craig has enjoyed a career of supporting some of the finest artists on tour today, and has traveled to more then 10 countries playing some of the worlds largest music venues and festivals. While not touring Craig also enjoys performing with his own project Drumapalooza The Band, which also includes his brother/drummer Spencer. P.T. Pederson honed his skills on the road and recording with Charlie Musslewhite in the late 60's early 70s, replacing one of his idols the great Jack Myers. He went on to play with Charlie Musslewhite, John Brim,Big Walter Horton, Johnny Young, Luther Tucker, Lowell Fulson, Fenton Robinson, Koko Taylor, Big Time Sarah, John Brim, Robben Ford, Pinetop Perkins and Sunnyland Slim. At home in Milwuakee he played with Jim Liban and Brian Lee. Blessed with a great sense of rhythm and time he takes the rock at our live shows and gives the old man a break by tearing up the house with his great choice of grooves.